I came across a photo on Getty Images that I have never seen before. 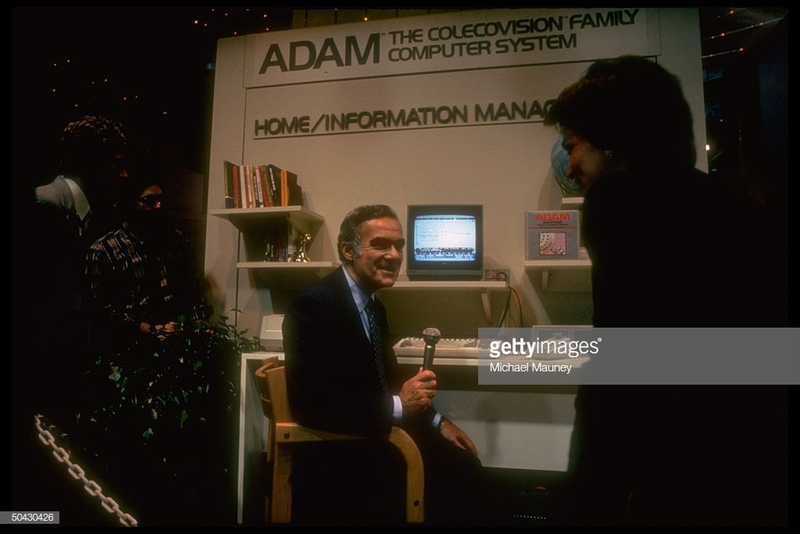 It appears that Coleco’s CEO Arnold Greenberg is showing off the Coleco ADAM computer at a trade show. In the background of the image, sitting on a shelf is a package with the ADAM logo. If I was willing to pay a huge amount of money, I could download a very large image which would most likely reveal what that item is. I’m not willing to pay that. If you know that ADAM item, let me know in the comments below. Thanks! EDIT: I was looking at this photo some more and you can see that the console is one of the prototype/mock-ups we seen in publicity shots. The tape drive doors and lack of eject button on top is what drew me to that conclusion. Perhaps those doors do work or maybe the tape drives are just for show, but still has the built-in word processor. I want my hands on those prototype models even if they are just empty shells. Looks like a prototype package for a modem. I’m seeing a part of a telephone handset and the coilrd cord on the box. Just part of a line of productivity software that Coleco had planned for the system. Most were released, just the packaging changed from what is shown in the picture. I will email you scans from a Press Kit that explain everything as well as a Press Release letter so that you can post it all here. Looking forward to that. Also, that idea of an eject on the keyboard sounds pretty neat and wouldn’t surprise me if that was an idea being tossed around. Oh yeah…. the Data Drives without eject buttons. Just prototypesfor these early Trade Shows, but I do recall hearing that early versions of the keyboard may have had an Eject Botton for the Data Drives. MAY is the proverbial word.